The data structures are used to represent playable items like e.g. a music track or playlist. The data structure classes are documented in the sections below and the rest of this section contains a more thorough introduction. 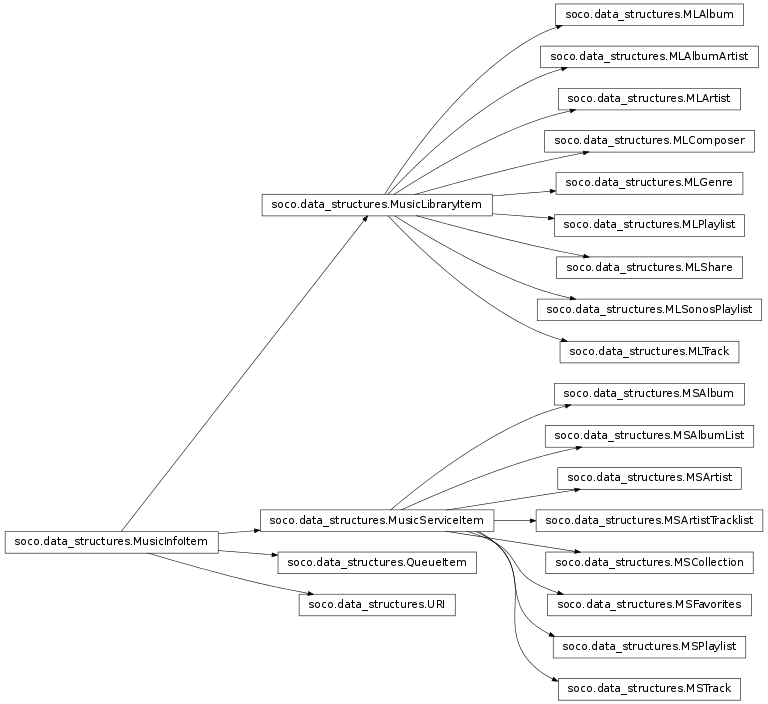 To expand a bit, the data_structures sub-module consist of a hierarchy of classes that represent different music information items. This could be a “real” item such as a music library track, album or genre or an abstract item such as a music library item. Certain functionality for these information object, such as producing the XML that is needed for the UPnP communication can be attached to the elements themselves. Many of the items have a lot in common and therefore has shared functionality. This has been implemented by means of inheritance, in such a way that common functionality is always pulled up the inheritance hierarchy to the highest point that have this functionality in common. The hierarchy is illustrated in figure the figure below. The black lines are the lines of inheritance, going from the top down. There are 8 types of music library items, represented by the 8 classes that inherit from it. From these classes all information items are available as named properties. All of these items contains a title, a URI and a UPnP class, so these items are defined in the MusicLibraryItem class and inherited by them all. For most items the ID can be extracted from the URI in the same way, so therefore it is defined in MusicLibraryItem.item_id and the few classes (MLTrack, MLPlaylist) that extract the ID differently from the URI then overrides this property. Besides the information items that they all share, MLTrack and MLAlbum define some extra fields such as album, album_art_uri and creator. One of the more important attributes is didl_metadata. It is used to produce the metadata that is sent to the Sonos® units. This metadata is created in an almost identical way, which is the reason that it is implemented in MusicLibraryItem. It uses the URI (through the ID), the UPnP class and the title that the items are instantiated with and the two class variables parent_id and _translation. parent_id must be over written in each of the sub classes, whereas that is only necessary for _translation if the information fields are different from the default. Return a namespace/tag item. The ns_id is translated to a full name space via the NS module variable. Return the music library item that corresponds to xml. The class is identified by getting the parentID and making a lookup in the PARENT_ID_TO_CLASS module variable dictionary. Initialize the content as an empty dict. Return the equals comparison result to another playable_item. Abstract class for a queueable item from the music library. The dictionary-key-to-xml-tag-and-namespace- translation used when instantiating a MusicLibraryItems from XML. The default value is shown below. This default value applies to most sub classes and the rest should overwrite it. Initialize the MusicLibraryItem from parameter arguments. **kwargs – Extra information items to form the music library item from. Valid keys are album, album_art_uri, creator and original_track_number. original_track_number is an int, all other values are unicode objects. Produce the DIDL metadata XML. Return an instance of this class, created from a dict with parameters. content – Dict with information for the music library item. Required and valid arguments are the same as for the __init__ method. Return an instance of this class, created from xml. xml – An xml.etree.ElementTree.Element object. The top element usually is a DIDL-LITE item (NS[‘’]) element. Inside the item element should be the (namespace, tag_name) elements in the dictionary-key-to-xml-tag-and-namespace-translation described in the class docstring. Get and set the UPnP object class as an unicode object. The id is extracted as the part of the URI after the first # character. For the few music library types where that is not correct, this method should be overwritten. Get and set the title as an unicode object. Get the dict representation of the instance. Get and set the URI as an unicode object. Instantiate the MLTrack item by passing the arguments to the super class MusicLibraryItem.__init__(). **kwargs – Optional extra information items, valid keys are: album, album_art_uri, creator, original_track_number. original_track_number is an int. All other values are unicode objects. Get and set the album as an unicode object. Get and set the album art URI as an unicode object. Get and set the creator as an unicode object. Get and set the original track number as an int. Instantiate the MLAlbum item by passing the arguments to the super class MusicLibraryItem.__init__(). **kwargs – Optional extra information items, valid keys are: album_art_uri and creator. All value should be unicode objects. _translation – The dictionary-key-to-xml-tag-and-namespace- translation used when instantiating a MLArtist from XML is inherited from MusicLibraryItem. Instantiate the MLArtist item by passing the arguments to the super class MusicLibraryItem.__init__(). Class that represents a music library album artist. _translation – The dictionary-key-to-xml-tag-and-namespace- translation used when instantiating a MLAlbumArtist from XML is inherited from MusicLibraryItem. Instantiate the MLAlbumArtist item by passing the arguments to the super class MusicLibraryItem.__init__(). Class that represents a music library genre. _translation – The dictionary-key-to-xml-tag-and-namespace- translation used when instantiating a MLGenre from XML is inherited from MusicLibraryItem. Instantiate the MLGenre item by passing the arguments to the super class MusicLibraryItem.__init__(). _translation – The dictionary-key-to-xml-tag-and-namespace- translation used when instantiating a MLComposer from XML is inherited from MusicLibraryItem. Instantiate the MLComposer item by passing the arguments to the super class MusicLibraryItem.__init__(). _translation – The dictionary-key-to-xml-tag-and-namespace- translation used when instantiating a MLPlaylist from XML is inherited from MusicLibraryItem. Instantiate the MLPlaylist item by passing the arguments to the super class MusicLibraryItem.__init__(). Class that represents a music library share. _translation – The dictionary-key-to-xml-tag-and-namespace- translation used when instantiating a MLShare from XML is inherited from MusicLibraryItem. Instantiate the MLShare item by passing the arguments to the super class MusicLibraryItem.__init__(). Class that represents a queue item. Instantiate the QueueItem by passing the arguments to the super class MusicInfoItem.__init__().